Poured from 500ml bottle. Gift from a friend. Dark copper with redish tones, first pour produced a nice offwhite creamy head, subsequent pouring produced nothing! No head at all even no lacing after that. Disapointing! N - strong maple syrup, oak, vanilla, banana, extremelly sweet smell. M & F - carbonation is medium, beer is somewhat thin in mouth, a bit watery should I say. Bitternes is low. Strong flavour of maple and vanilla, brown sugar, small notes of date and figues. After taste is not very long, sweet and dry. Afterall, this beer is a bit of a deception. To thin and watery, needs more malt to support this massive sweetness. Reminicent of cream soda, too bad. Bottle: Poured a light clear brown color ale with a medium foamy head with average retention and no lacing. Aroma of light sweet rum notes which is definitely different then any beer I tried before. Taste is also dominated by some sweet caramel malt with some light rum notes. Average body with some medium carbonation and no apparent alcohol. Not a great beer by any feat but quite pleasant and different then most beers on the market. Definitely better then what I was expecting. Yeah! Another complex beer to taste! The bottle says, brew with rhum! So why not try it?? I'm not a fan of strong liquor but the curiosity force me to try. The color, very dark but not as stout. The smell, interesting!! A small sip is enough to enjoy the mouthfeel, and about this, what a mouthfeel! Once swallow, the goosebumps come, for me it's a good indicator of pleasant taste!!! If you have a chance to find it (a little bit rare) try without hesitation. This has got to be the noisiest beer I have had in years. When I popped the cap, there was an audible whoosh of gas followed by the fizz of a super effervescent ginger ale. The beer formed a head in the bottle! No kidding. And the bottle was not shaken or agitated when I took it out of the fridge. It poured a nice cloudy amber with a half inch head that dissipated within 20 seconds. The head left a thin collar that had good lacing and legs, considering the minimal amount of foam to work with. The smell was new aromas for me. Up front, I got apple cider, almonds, sour white grapes or cane sugar without the cloying sweetness. Taste was like fresh cider. Very subtle malt and hops. Like Capt Morgan Spiced Rum in beer form. Mouthfeel was interesting. Big crisp effervescence that danced on the tongue. A long finish. Drinkability: Not what I was expecting, so I was pleasantly surprised at the presentation. This will not be on my all time favourite list, but it has considerable merit for a good beer in its class. 500ml bottle - so, 'the cottage life', en anglais. Sort of cagey in their label description about how they get the rum into the beer, methinks. This beer pours a clear, medium bronzed amber colour, with two fingers of puffy, loosely foamy, and bubbly tan head, which leaves a few instances of low-lying coral reef atoll lace around the glass as it evenly sinks away. It smells of rich caramel/toffee/nougat, real melted vanilla ice cream, maple syrup, brown sugar, bruised bananas, and some very subtle earthy and saccharine spice notes. The taste is sweet caramel malt, faintly biscuity toffee squares, banana pudding, Mars Bars nougat, vanilla-forward oak, thin maple syrup, reduced brown sugar, and more weak and impossible to identify earthy spiciness. The carbonation is fairly mild in its insouciant-seeming frothiness, the body a solid middleweight, and mostly smooth, with a wee airy creaminess slowly evolving as things warm up a tad around here. It finishes still pretty sweet, but by now my tastebuds have been severely beaten into submission (ok, 'seduced'). Overall, this is indeed a heady dessert brew, one that probably best falls into the Yuletide season's affectations for all things sweet. I'm not getting any direct rum character here, just wisps and suggestions of deconstructed esters. Maybe that's how they did it after all. S: strong chocolate smell, nice brown rhum aroma, very nice indeed. A: Pours a deep amber, with a bit of a red hue to it. The head is a sandy color, shimmering, with several larger bubbles allowing its scent to permeate. S: Toasted malts along with some almost fruity scents make up the nose. While it smells pleasant, it delivers a scent that comes across as quite simple. T: The flavour is quite nice on this beer, with a taste of brown sugar very apparent following a swallow--perhaps some molasses before that. There is a note of maltiness which does make for a rather sweet beer. This could be a little off-putting to some, though I find it to be tasty. M + O: Carbonation is a little lower than many, with just a little zip on the tip of the tongue before it spreads out over the palate. It has a medium body and, with the sweetness of the beer, is maybe just a little bit cloying. Overall, it is a decent selection and one that I do not regret trying. 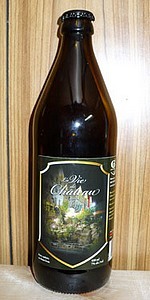 Tasted this at Le Grimoire in Granby... Was really disapointed. But then, ordered a pint at Le St-Bock. Boy, was that a different beer or what ?!! Subtile flavors and a great finish. Almost like almonds to my taste buds. After a while tough, it gets on your stomach like cream soda would do. Do not abuse of this stuff. Great one shot beer and it's different so give it a try. Color is dark orange with a nice creamy head. However the head disappear too fast. The aroma is simplistic... rum. I don't get any malts, caramel or hops at all... that is sad. The taste is similar. Rum... that's all. This is too one dimensional for me... and I'm sure it isn't in style too. No bitterness at all. A - Pours a dark orange or dark copper kinda colour with good carbonation. A nice pillowy white head sits on top. Bright. Half finger of retention with very little lacing. S - Very interesting. Never smelled a beer like this. Sugary fruits and some rum maybe. Sugar and banana. Syrupy fruits. Very interesting. Smells sweet but different. T - A little mild. Syrupy fruits with sugar and some rum notes with an odd finish of yeast. M - Light carbonation with a medium body and a sweet finish that goes dry and clean in a second. O/D - Not a bad beer. Interesting yet lacking to some degree. Could use some more diversity and richer flavour, but interesting nonetheless. More for the rum enthusiast. Mysterious/Interesting looking 500ml bottle poured into tulip. L- Thin head and little lacing over hazy light brown. S- Smells almost exactly like a liqueur-filled chocolate. Chocolate covered raisins. A little marshmallow. Maybe a little more cognac-y than rum. D- High for the type. Interesting brew. Did not expect this kind of feel for a rhum beer. I would not buy it again unless I found it on tap but I would suggest it to a friend. Amber and mostly filtered with a little visible carbonation, and 3 fingers of light beige head. It was a gusher though relatively undisturbed before opening. Smells of rum, chocolate, coke, and chocolate milk. The taste totally follows the nose, with an emphasis on chocolate milk. It ends with a light, bitter hopping. Light body, with a little, foamy carbonation. Got near Montreal at a gas stop, in Quebec, and drinking March 21st, 2018 in Muskoka, ON. Really enjoying this unique brew. Poured from a 500ml bottle. Very surprising. Powerful oak / vanilla aroma and taste. The appearance was quite flat, no head retention. Aroma is very apparent, vanilla, oak, banana. Taste is quite similar to aroma. Very foward. Vanilla comes fom rum and oak. Good winter spiced beer.